Understanding of the fundamental concepts of hydraulics. Reading of the hydraulic circuit drawing and understanding the function of the various components in the circuit. 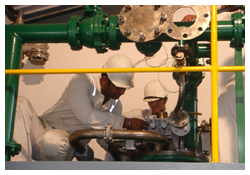 Disassembly / Assembly of flow control valve, relief valve and axial piston pump. Procedure and precautions in stripping operation. 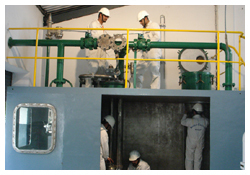 Procedure and precautions in purging operation and analysis of the purging result. Practical training on cargo pumping operations like loading, discharging, stripping, and purging. Safe and Efficient operations of the Framo cargo pumping system. Discussion of case studies and service letters.